Opening Sentence:It was a dazzling four-sun afternoon. Synopsis:For the people of Kalgash, complete darkness is a terrifying and impossible unknown: their six suns constantly illuminate all corners of the known world. Nightfall, the short story, first appeared in 1941. Consistently voted the best SF story ever published, Asimov, in collaboration with Robert Silverberg, has now expanded his original creation into a novel – exploring what happens to society after darkness fell. It is destined to become a new classic. Comments:I read about Nightfall whan it was mentioned in passing in New Scientist magazine. Their description interested me, so I borrowed the book from the library. This is the first Isaac Asimov I have read and I can see why he has such a great reputation. Living on a planet with just one sun, we do tend to take darkness and stars for granted. But what if we had never seen either? How would a people, used to eternal light, cope with their first exposure to night? How would someone who had never seen the night sky deal with all those millions of stars? 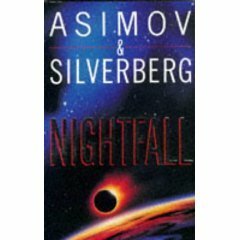 Nightfall is a riveting account of how one society faced just such a challenge and it is an account that is well worth reading.